I guess it’s seeing the two within a week or two that means that Richard Grayson’s Nothing Can Stop Us Now reminded me in a way of Chris Marker’s Silent Movie which is included in the Whitechapel Gallery exhibition Chris Marker: A Grin Without a Cat. The connection is a simple but somewhat tenuous one: both works feature five monitors. In Grayson’s piece, these run in a horizontal line across the front of the space using the full width of the building. In Marker’s Silent Movie the monitors are in a vertical tower. The tower is a bolt together structure which is both the simplest solution to housing the monitors and also, in its industrial simplicity, somewhat constructivist in feel. 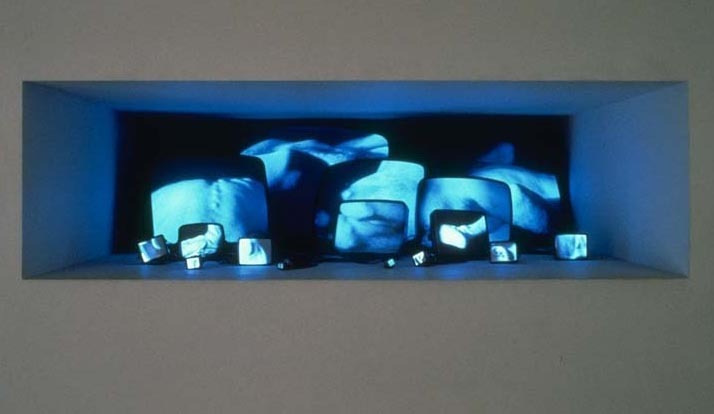 Susan Hiller’s Witness, which I first saw in a disused chapel in north Paddington in 2000 – and which I wrote about for MostlyFilm a couple of years ago – is one of my favourite artworks, I think (yeah, yeah, it’s a long and ever changing list, but Witness is always there). There’s something about the weirdness of the narratives – recordings of tales of encounters with the unexplained, stories about strange lights in the sky told in many different languages – the beauty of the installation and the oddness of trying to carry on listening even when the story is told in a language you don’t understand, that I find compelling. Coming across some of those same voices in a different form – as part of the soundtrack to a work called Sounding – in the Box at Pippy Houldsworth was an unexpected pleasure (I’d known about the main exhibition in the space; the Hiller was a bonus). The Box is a small booth space, here containing a small screen housed in a box frame; three sets of headphones hang just outside the booth (though the work is best experienced solo) and it’s these that add sound to the video abstraction on the screen. 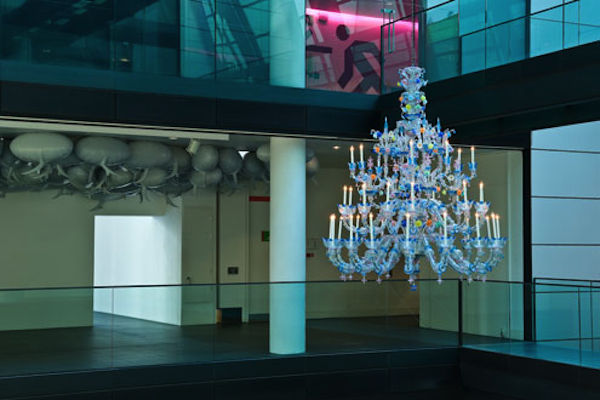 Thinking about Kris Martin’s Mandi iii and its futile attempts to communicate information reminds me about Cerith Wyn Evans’s chandeliers, one of which – the snappily titled Astrophotography…The Traditional Measure of Photographic Speed in Astronomy…’ by Siegfried Marx (1987) – was in the Fade In/Fade Out exhibition at Bloomberg SPACE. Unlike Martin’s piece though, Wyn Evans’s did communicate its message, alebit in a way few could read without assistance. Astrophotography…The Traditional Measure of Photographic Speed in Astronomy…’ by Siegfried Marx (1987) is not just the title of the work but also of the text it is painstakingly spelling out in morse code. Writing about Bruce Nauman’s Days yesterday put the idea of sound and the way information is communicated firmly in my mind, so coming across a leaflet for Fade In/Fade Out – a show I saw at Bloomberg SPACE a few years ago – while sorting through a pile of random paperwork felt like a very good coincidence. There were a few great pieces in the exhibition, but the work that’s stayed with me most clearly is Kris Martin’s Mandi iii, a station information board loudly and relentlessly updating to make sure we have up to the minute information. But as the flaps clicked over the lack of information remained; every surface on the board was plain black. The idea of the digital composite that Idris Khan uses to such great effect isn’t a new one by any means. Possibly somewhat surprisingly it goes back several decades, with Nancy Burson – who had been involved with Experiments in Art and Technology (EAT) since leaving college in the late 1960s – making composite portraits digitally in the early 1980s. Composite photographic portraits of course have a much longer history – Francis Galton’s composites of criminal types were made in the late nineteenth century for instance – but the use of digital is something Burson pioneered. It’s not all about the technology though. Indeed, it’s as art that Burson’s work interests me more. In building her composites, Burson is effectively making layered photomontages and accordingly her work can be seen as the combining of two (or more) elements to reveal a third meaning. In Warhead I, Burson has combined the imagges of world leaders accoring to the percentage of the world’s nuclear arsenal they had at their disposal. 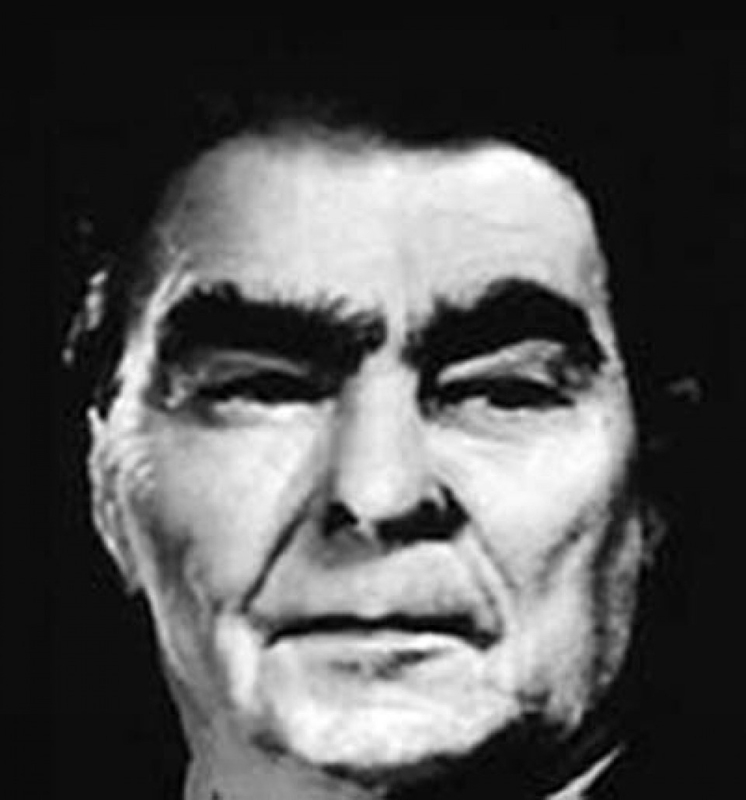 This being 1982 that effectively mean merging the faces of Leeonid Brezhnev and Ronald Reagan. Though in a way this makes me think about the significance of nuclear weapons during the Cold War it’s also interesting that it seems to come from a simpler time. How many faces would be in the mix now? And would anyone be able to accurately pinpoint the percentages? As of Wednesday, analogue telly is a thing of the past. Well okay, it’s clinging on for a few more months in a couple of parts of the country, but for most of us in the UK old tellies either need to be attached to a digibox or it’s all over. 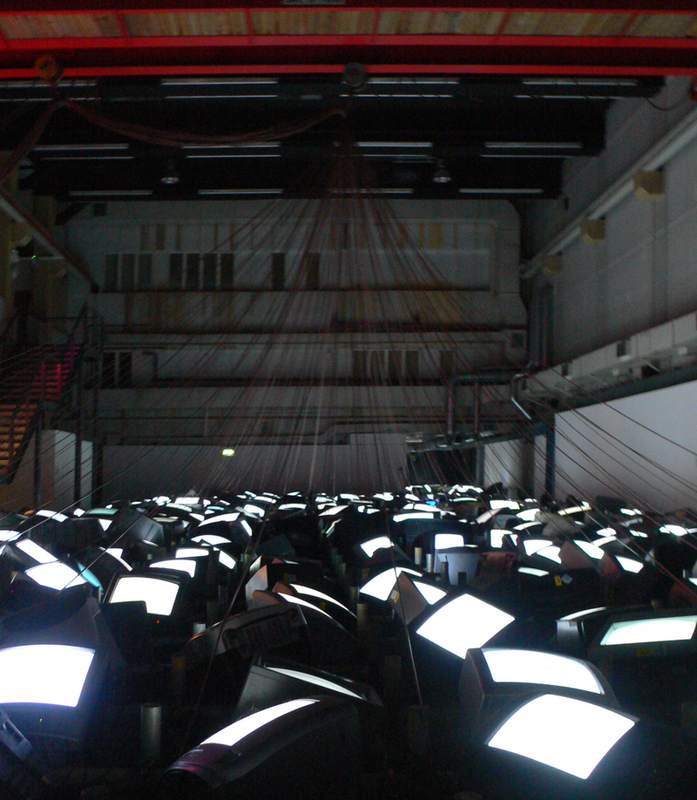 At Ambika P3, David Hall’s End Piece … exhibition (part of which I wrote about here a week or two ago) is a fitting way to mark its passing. 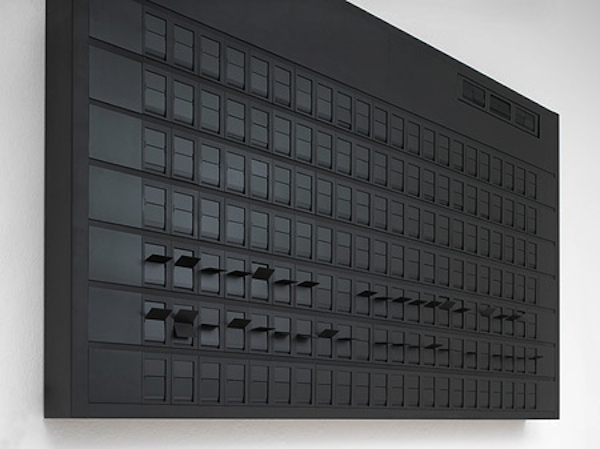 The centrepiece of the exhibition is the extraordinary, descriptively titled installation 1001 TV Sets (End Piece). With the analogue switchoff on Wednesday the work went from being a bewildering jumble of images with a cacophonous soundtrack to 1001 different types of snow. The sound is still loud but it’s a constant static now rather than the chaos of five competing television channels. 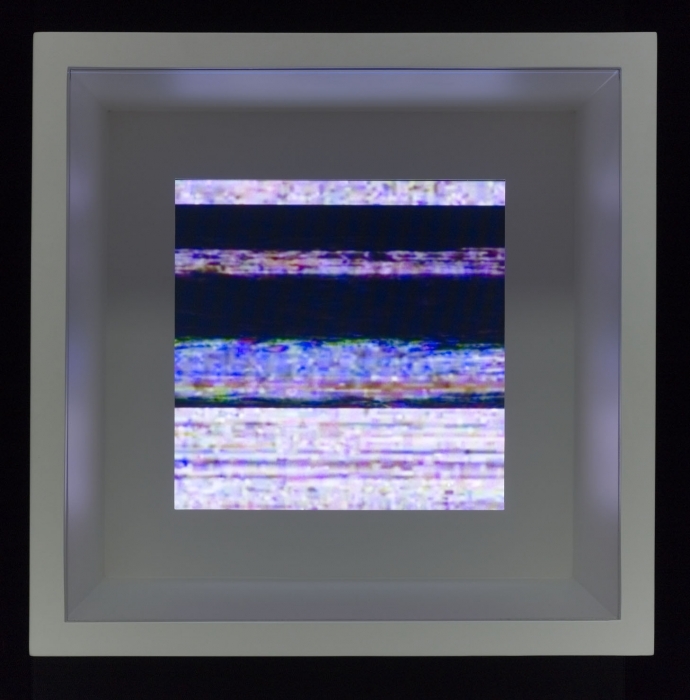 Like Nam June Paik, Gary Hill often uses the physicality of the television as part of the work but for Hill the box is something to shed leaving the screen and the tube behind it to occupy the space. 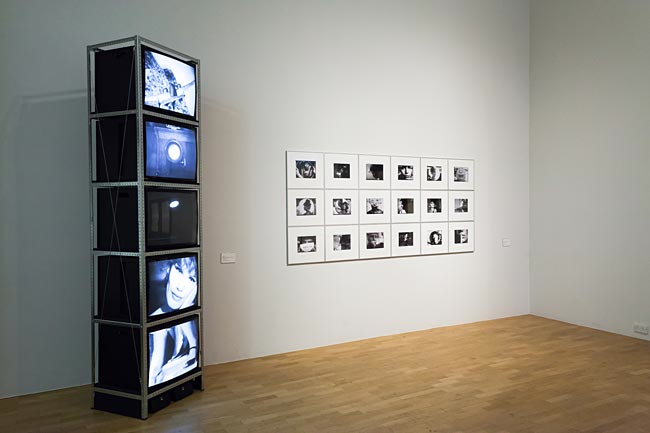 Multi-screen video works become installations in which the means of display takes on its own significance. Inasmuch As It Is Always Already Taking Place is, in a way, a self portrait, albeit a fragmented one and one which tells us little about Hill.